Bring clam juice and wine to a boil in a large nonstick pan; stir in basil and tomatoes. Cook down slightly. Season with salt and pepper; remove and keep warm. Rinse any ice glaze from frozen Alaska Sole fillets under cold water; pat dry with paper towel. Heat butter and oil in a heavy nonstick skillet over medium-high heat. Add sole fillets; cook 2 to 3 minutes until browned. Gently turn fillets over and season with salt and pepper. Cover pan tightly and reduce heat to medium. Cook an additional 2 to 3 minutes. 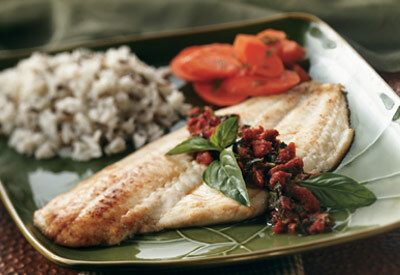 (Reduce cook time by half for fresh or thawed fillets.) Cook just until fish is opaque throughout. Spoon sauce over fillets to serve.